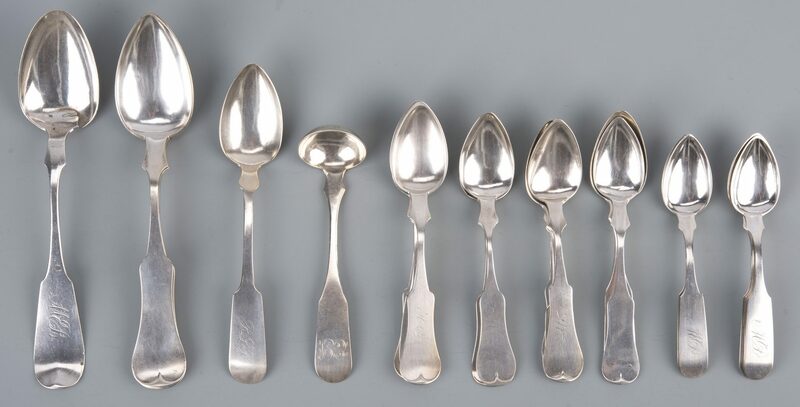 Group of assorted mid-19th century coin silver with Ohio, Missouri, and Kentucky maker marks, 21 pieces total with a mixture of fiddle, fiddle tipt and double swell fiddle handles. 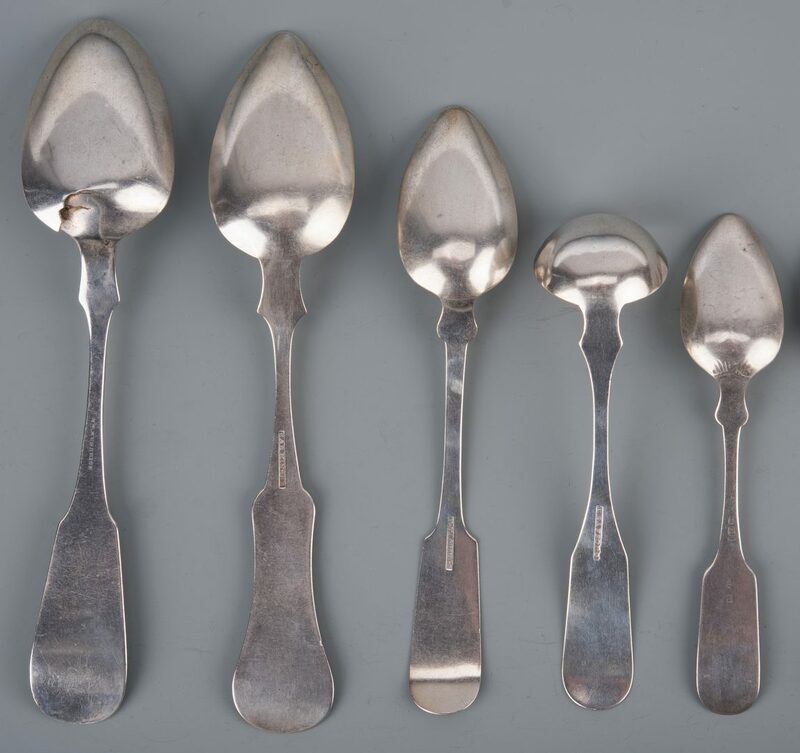 Ohio: Edward and David Kinsey, working Cincinnati 1844-1861 (3 teaspoons, 2 tablespoons), Pulaski Scovil and Edward Kinsey, working Cincinnati 1836 (5 teaspoons), David Kinsey, 1819-1874(1 teaspoon, 1 tablespoon), Henry Harry Safford, working Zanesville 1816 (1 teaspoon, 1 cream ladle), Wilson McGrew , working Cincinnati 1840 (1 teaspoon), William Blynn, working Columbus 1850-59 (1 teaspoon), and H. Hastings, working Cleveland 1836-47 (1 place spoon). 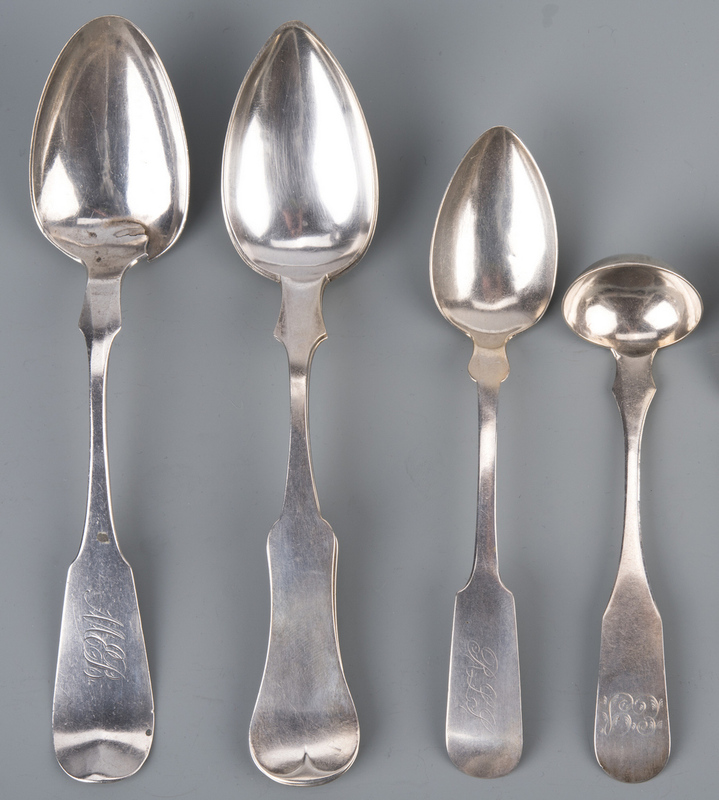 Missouri: Edward Mead & Company, working St. Louis, circa 1865 (1 teaspoon), Eugene Jaccard & Co., working St. Louis circa 1852-1862 (1 teaspoon), and Menkens, St. Louis circa 1864 (1 teaspoon). 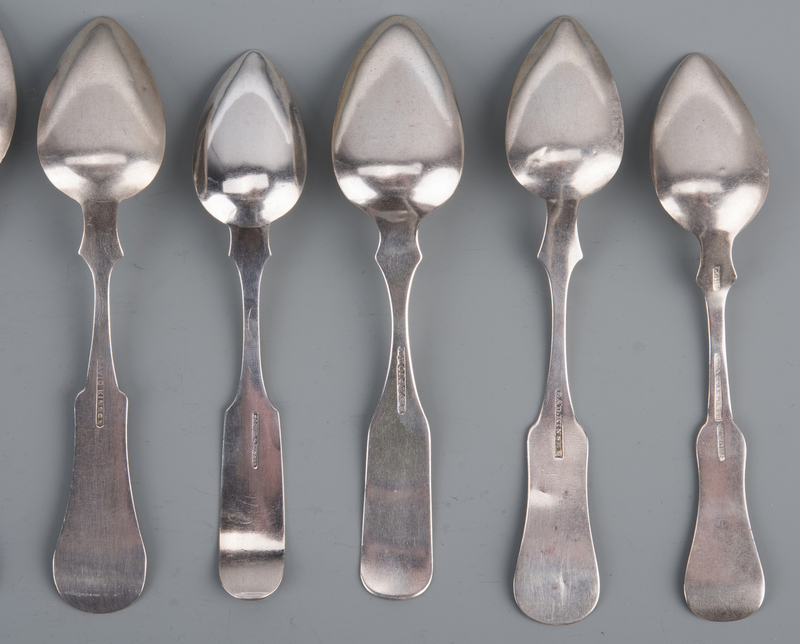 Kentucky: William Kendrick, working Louisville, 1810-1880 (1 tablespoon). 5 1/2″ to 8 3/4″ L. 14.97 total troy ounces. Provenance: Private Knoxville, TN collection. CONDITION: Most pieces show wear consistent with use. Kendrick spoon with damage to bowl. Most monogrammed.